Snow storms result in accumulating snow on the roads resulting in driving becoming hazardous. Municipal authorities are mostly responsible for ensuring that the roadways, back lanes, sidewalks, active transportation trails and designated park pathways are mainyained in such a manner so as to provide safe and accessible operating conditions for motorists, cyclists and pedestrians; reduce the hazards of icy road conditions; and facilitate the handling of emergencies by Police, Fire and Ambulance Services during winter. Salters are sent out at the start of the storm when snowfalls do not exceed 8 cm (3″) and plows are sent to clear the roads when the snow on the roads is accumulating faster than the salt can melt it away (when snowfall exceeds 8 cm). Main roads with high traffic volume roads are cleared first. Streets with less traffic volumes and lower speeds are cleared after the main roads to ensure that residents, and emergency service vehicles like fire trucks and ambulances, can safely travel to hospitals, schools, work and get to public transportation systems during or immediately after a snowfall. Approximately 150 kilograms per Canadian is used on roads each year to make them safe for travel in winter. In Ontario the salt comes from the world’s largest salt mine located on the Eastern shore of Lake Huron in Goderich. How does salt act as an ice melter? All icy surfaces have a thin layer of water. When salt (Sodium Chloride NaCl) is applied to such surfaces, salt starts to dissolve. This ionises the salt into positively charged sodium and negatively charged chlorine ions. These ions, in turn, react with water molecules and form hydrated ions (charged ions joined to water molecules). This process gives off heat, because hydrates are more stable than the individual ions. That energy then melts microscopic parts of the ice surface. When an automobile drives over the ice, the pressure helps force the salt into the ice and more of this hydration occurs. The ice-cream makers of the per-refrigerator days employed the same principle (freezing point depression). The ice and salt mixture ensured that the temperature was well below the freezing mark (0 degrees C), even though the ice melted. Environment Canada has recognized that salt has adverse impacts on wildlife, plants, water and soil, and in 2001 considered adding it to the country’s list of the most toxic substances. Instead, in 2004, the government instituted a voluntary code of practices to encourage municipalities and others to use the de-icer more sparingly, while maintaining highway safety. But with the vast amount used, huge quantities are still polluting soil and water. It noted that after winter thaws, there were spikes in the amount of salt in streams with those taking runoff from the main highways having approximately double the concentration of the pollutant than watercourses nearby that don’t take storm water. Environment Canada says it is currently reviewing whether the voluntary practices code has led to any reduction in the amount of salt being spread on roads. Pre-wetting is the process of spraying the road surface with a liquid de-icing agent (salt brine) before spreading the salt on the roadway. 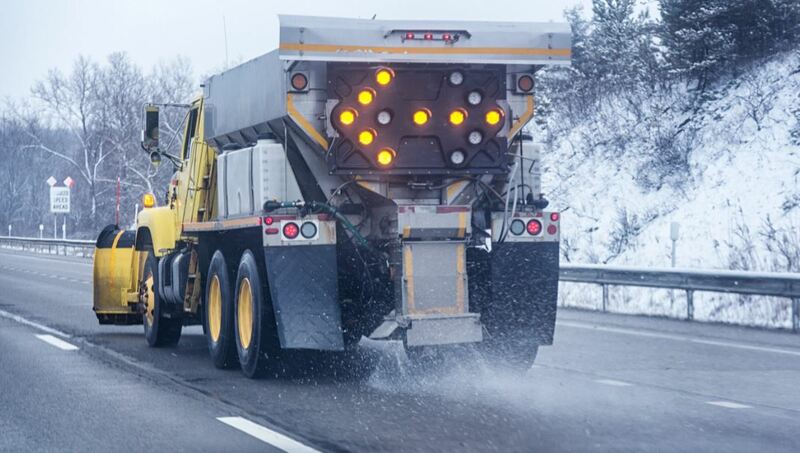 A salt brine solution is spread n the roads before any expected freezing temperatures. The liquid starts to work before the precipitation starts to freeze. It acts like a barrier between the road and the snow/ice, so it doesn’t stick to the road and cause slippery conditions. If no precipitation happens, salt brine stays on the road and last for several days. Pre-wetting results in less salt being spread, saving money and minimizing threat to the environment. Wet salt clings to the road instead of bouncing off or being swept off by traffic. A living snow fence is a barrier created by plants, shrubs and trees to reduce snow blown across roads. Planting trees and shrubs is not only more attractive and more environmentally-friendly than building a wood fence, but also more convenient than putting up and taking down traditional snow fences. Snow fences force wind to go around and through a fence. This causes the wind to lose energy and speed. As the speed of the wind slows, the snow forms a drift before or behind the snow fence. How much snow a fence traps depends on the height of the fence and the amount of snow that falls. 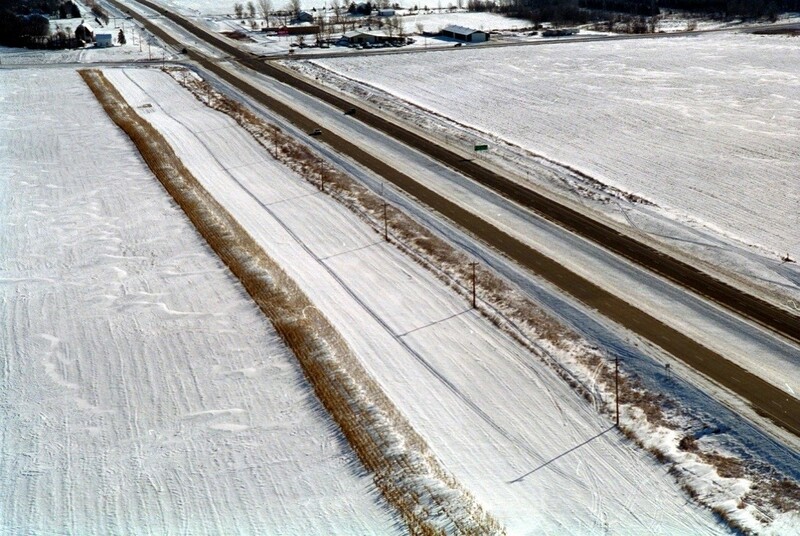 Manufactured snow fences are installed next to roadways that experience lots of blowing snow. Another effective snow fence is standing corn in the corn fields all along the roads. Each year in late summer, participating farmers leave a swath of standing corn (six to 12 rows wide), parallel to the road and about 20 meters from the road. Farmers are compensated for this. Delayed flights during and after a snow storm is common in Canada. Salt can never be used on an aircraft due to its high corrosion properties. The delay is mostly due to the de-icing activity carried out on all aircraft prior to take-off. The problem of ice or snow forming over the wings and tail of the aircraft is a major concern as it would adversely affect the performance of the aircraft, especially at take-off as the lift may be reduced. This ice has to be removed and the airports in Canada are equipped with deicers. 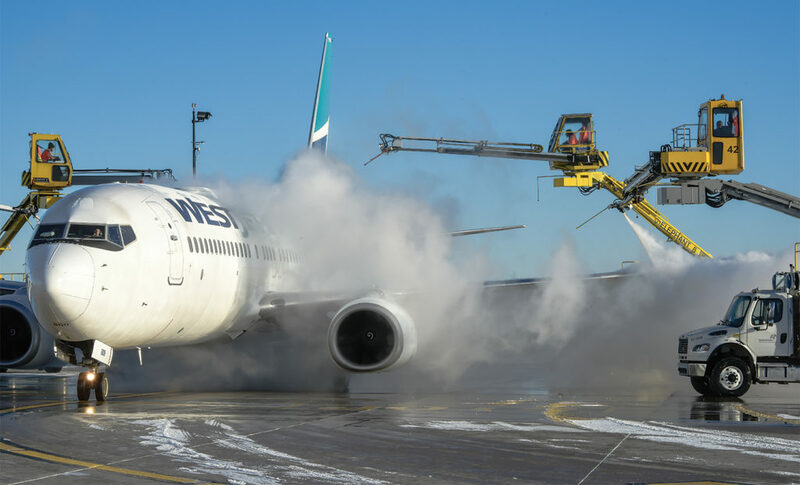 These are vehicles that spray a mixture of a glycol and water, heated and sprayed under pressure to remove ice and snow on the aircraft surfaces. While it removes ice and snow, deicing fluid has a limited ability to prevent further ice from forming. If winter precipitation is falling, such as snow, freezing rain or sleet, anti-icing fluid is applied after the deicing process is complete. This fluid is of a higher concentration of glycol than deicing fluid. It has a freezing point well below zero degrees Celsius and therefore is able to prevent the precipitation that falls into it from freezing on the aircraft’s surface. Anti-icing fluid also has an additive that thickens it more than deicing fluid to help it stick to aircraft surfaces as it speeds down the runway during takeoff.